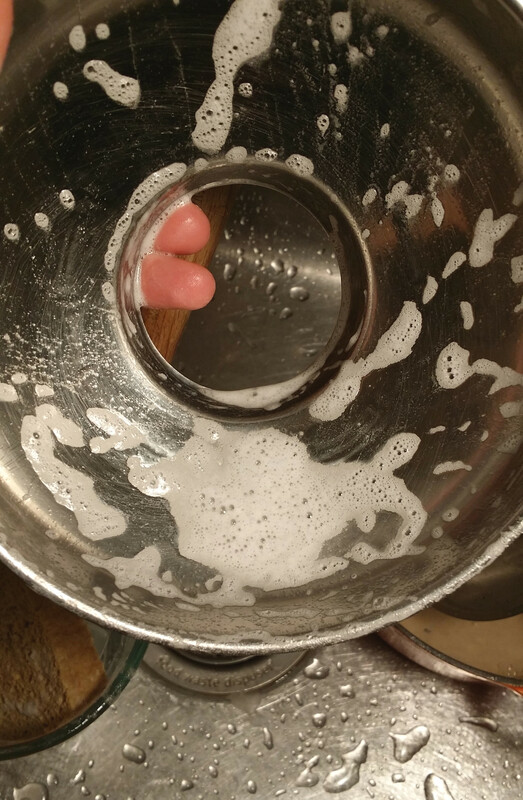 If you run a zero-waste or plastic-free kitchen, I can safely assume that you cook and that you generate the sinks full of dirty dishes to prove it. But if you don’t want to buy plastic bottles—and I’ve never seen dish soap in anything but—how can you wash those piles of dishes? Well, it turns out that, as with most consumer products, you can make your own dishwashing liquid pretty easily, but without the artificial fragrances, colors and many other chemicals—and for less money. 1. Use a cheese grater to grate soap. I grated WAY too much. You’ll need only 3 tablespoons. 2. 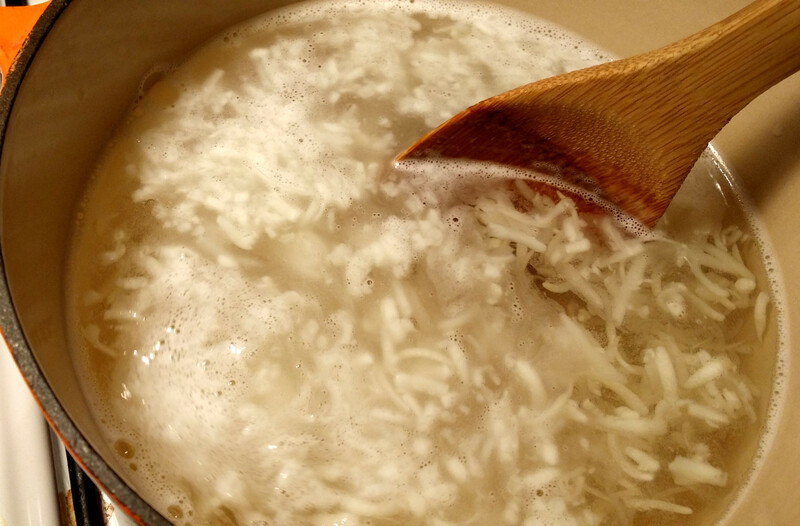 Heat water in a pot and add shredded soap. Once soap has melted, remove from heat. 3. 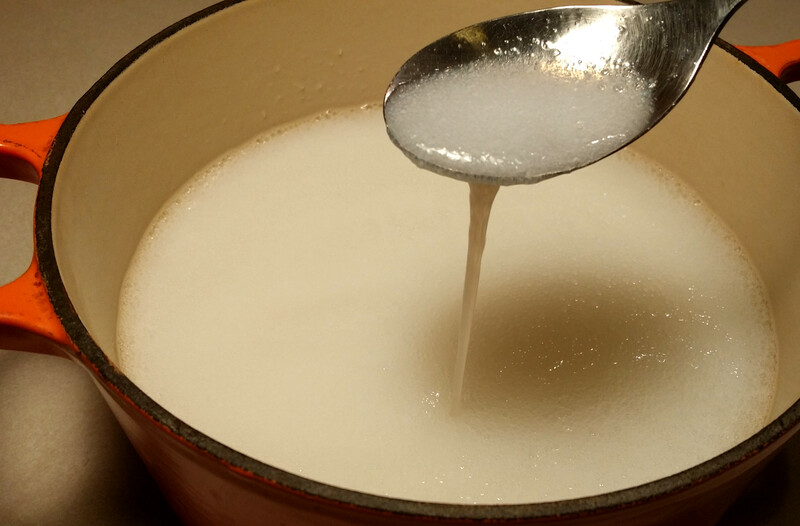 Stir in washing soda until dissolved. Go easy on this stuff! It makes the dish soap gel. And it’s extremely effective at doing so. I added too much for my first batch and the soap turned into a solid white clump. If that happens, just add more water and heat it up again to make the ingredients easier to mix together. I looked up sodium carbonate (washing soda), my concoction’s “active ingredient” if you may, on the Environmental Working Group’s (EWG) Skin Deep Cosmetics database, and I feel pretty safe about using it. It has a lower health concern rating than many other additives in commercial cleaners, such as sodium lauryl sulfate, the compound that makes detergent, shampoo and toothpaste suds up. 4. Cover and set mixture aside for several hours or overnight. In the morning, mine was very thick. Don’t worry! You can easily make it runny. 5. If your soap is too solid, blend it with a hand blender or in a blender. It will liquefy in seconds. 6. 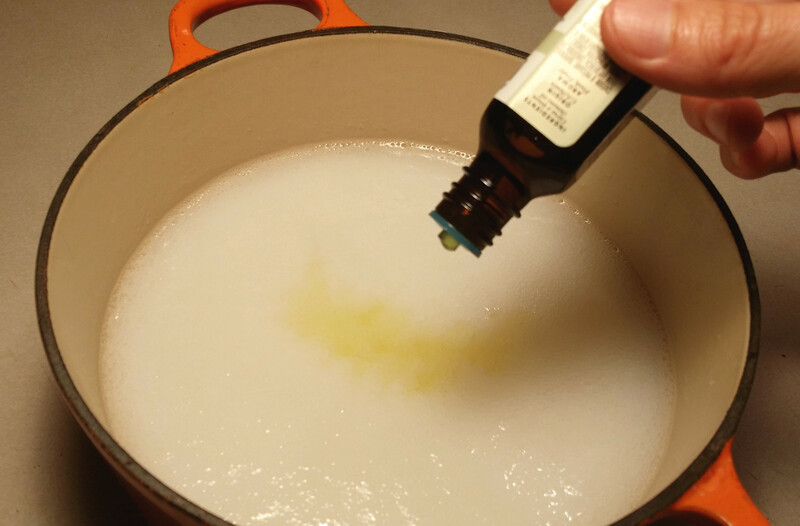 Add essential oil and stir until combined. I used lemon. 7. 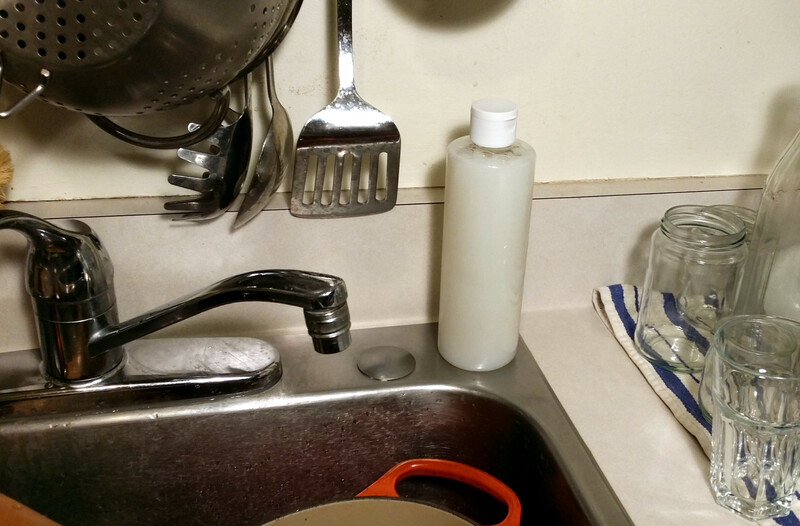 Transfer dish soap to a container. I looked in Goodwill for a second-hand glass or ceramic pump bottle, but found only shelf upon shelf of wine glasses in the housewares department. (I think everyone in the area is on the wagon.) So I filled an empty plastic bottle that has a flip-top lid. I’ll keep searching for a glass container. And here is the dish soap in action. 1. Use a cheese grater to grate soap. 3. 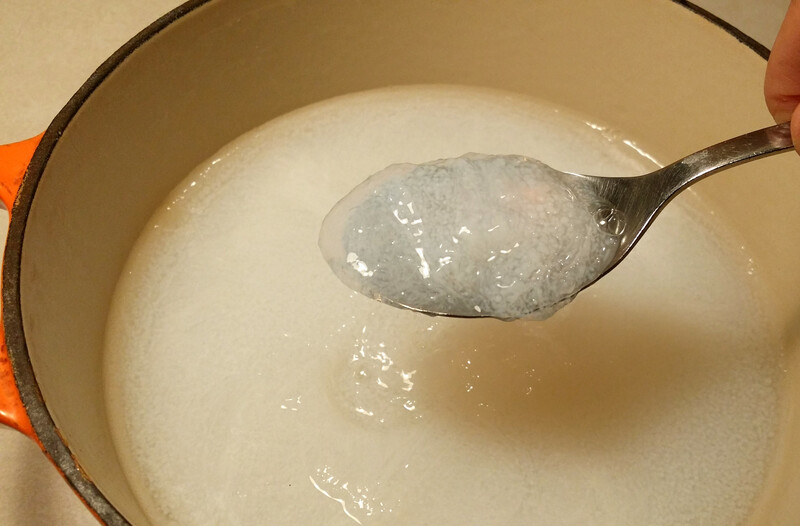 Stir in washing soda until dissolved. 4. Cover an set mixture aside for several hours or overnight. 5. 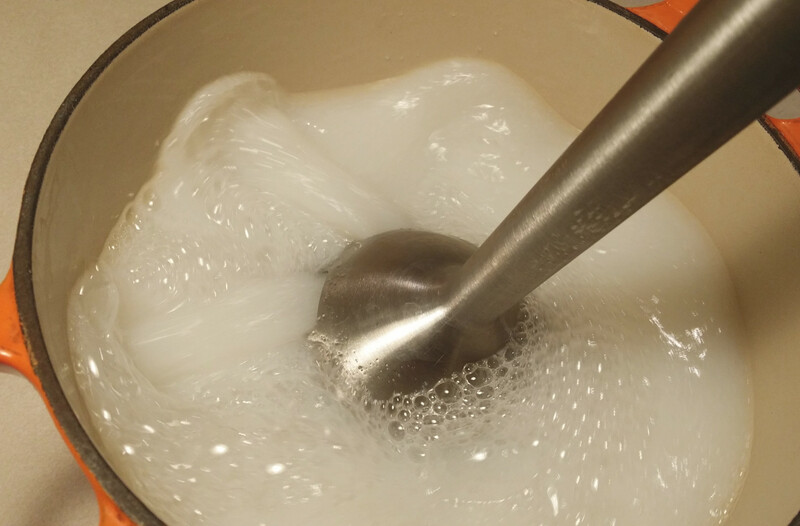 If your soap becomes too solid, blend it with a hand blender or in a blender. It will liquefy in seconds. 6. Add essential oil and stir until combined. 7. Transfer dish soap to a container. What a great idea! I hadn’t ever thought of this, but I definitely want to try it at some point. You’re welcome. Thanks for checking it out. I just sprinkle baking soda on greasy pots, pans and baking dishes. It works MUCH better than soap. Just cuts right through all the grease and leaves everything squeaky clean. I also use baking soda and vinegar to clean the bathroom sink and tub. I would never have imagined you could do that! 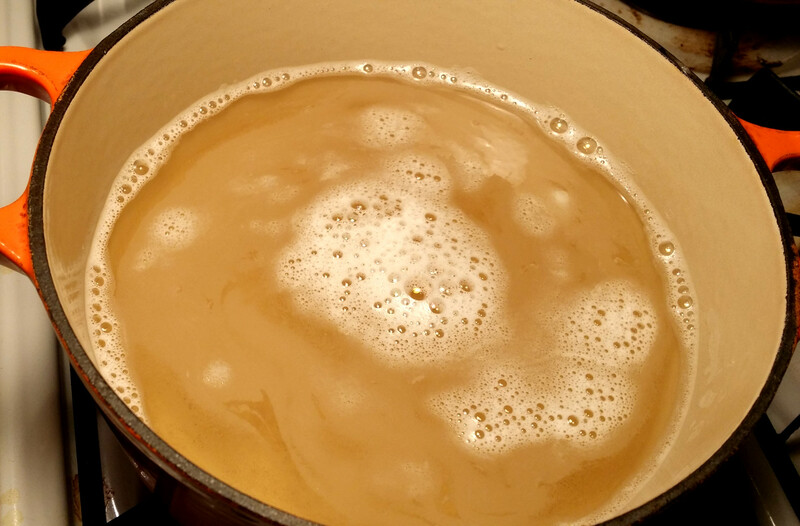 Have you ever posted a recipe for bathroom cleaner? Looks like we shop for the same stuff! Also, EWG is a great resource–thanks for getting the word out!!! I agree EWG is a great resource. 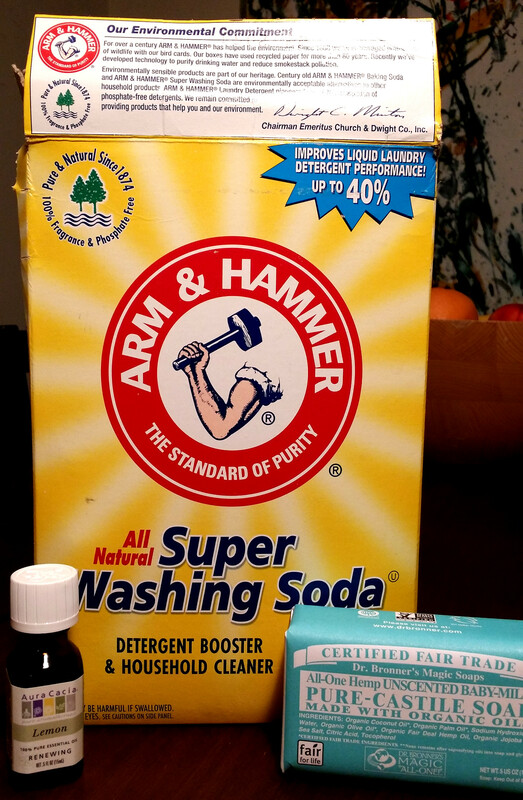 I make laundry detergent with washing soda, which I used here, and borax, which I considered using. After I looked up borax on the EWG Skin Deep database, I cut it. The washing soda ranked a 1 on the 1-10 hazard scale and the borax was a 5-6. The more you learn, the more you want to make EVERYTHING yourself–food, cleaners, personal care items, etc. Do you think you could use it as a handwash? One of the things I am struggling to give us is handwash in one particular room where we have a delibarately teeny tiny sink. It is a godsend having a sink in the room but there is no room for a bar of soap – only the small base of a handwash dispenser, tall enough to get over the taps? If I could make a handsoap to put in the same (admittedly plastic) dispenser it would be ideal! I haven’t tried it, but it should be milder on your hands. This is a must try for me. Thanks for sharing! Post courtesy of a fellow blogger. Check her blog out. Really cool stuff. If I can get the ingredients this is a project for tomorrow. I am almost out of dish soap and just scored a mason jar soap dispenser yesterday at TJ Maxx! Perfect timing! I bought all my ingredients tonight. Hope to make this on my next day off! I made this on Tuesday. Super easy and I like it! Using a Mason jar with as dispenser lid and it’s working great. Thank you so much for sharing! Yay! I’m so glad it worked out for you! I would like to have a mason jar pump. That sounds super cute. I think I’ve been to a TJ Maxx. I may have it mixed up with something else. Thanks so much for the vote of confidence. I really appreciate it. And thanks for sharing your vanilla recipe! I started some Tuesday night! I’ve been looking for a good DIY dish soap recipe. Can you use liquid castile? Can’t wait to try this! You’re welcome! I just left a rant about lawns on your blog 🙂 I agree, kids do love to grate things. They should enjoy making this. We can make so may things ourselves that the big consumer products companies have convinced us we need to buy. And come to think of it, a lot of them would make great kids’ activities. Thanks for the comment! Thank you Zero Waste Chef! You are really doing a great job on your blog to help the environment and teach others too! Thank you for these! I love all things David Suzuki 🙂 I looked up borax and I think people mix it up with boric acid. Is the essential oil necessary or just for the smell? I’d prefer to leave it out to save money and make it less expensive. Will that still work? Also.. Do you have any idea if washing soda is biodegradable? I don’t think I’ve ever actually seen it in a store. Is it in the baking section next to the baking soda or in the house cleaning section? I think the essential oil is just for the scent really. I have found conflicting information online about washing soda, baking soda, borax…like I tell my kids, just because you read it in Times New Roman, don’t take it as fact. BUT I do like care2 and found this on its site: http://www.care2.com/greenliving/the-wonders-of-washing-soda.html# According to that article, washing soda is biodegradable. Washing soda can be difficult to find but if your store carries it, it would be in the detergent/house cleaning section. Oh, I have also read that you can make it out of baking soda but I have never tried this: http://naturesnurtureblog.com/2012/05/08/ttt-turn-baking-soda-into-washing-soda/ I will have to experiment and write a post about that…Good luck in your washing soda quest! You probably already know this but just in case…. 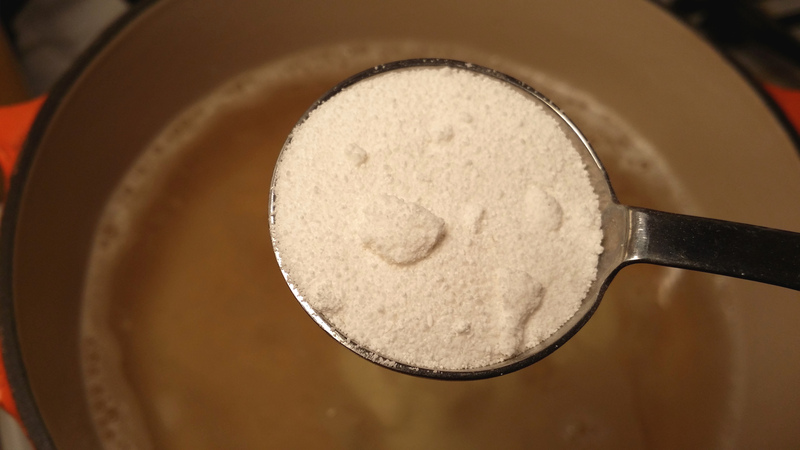 you can make washing soda from baking soda. I just bake mine for an hour at 400 degrees f on a baking sheet. This is way cheaper and easier for me! Thanks for the post. It is a great recipe and the step-by-step guide is very useful. I’ve read some women add vegetable glycerine to the mixture. What do you think about it? You’re welcome, Fani. Thank you for checking out the post 🙂 I think the glycerin may be to help soften your skin. I don’t have any so I haven’t added it. Maybe I will look for some though. If you try making this with glycerin, will you please let me know how you like it? Thanks! I am curios. I will make the dish soap and try it. So thankful for the instructions. I will post it then on my blog too, translated in German – would that be ok for you? Hi and thanks for the recipe. I’ve used lavender oil with mine but I’d like to try lemon to see if it works better with greasy dishes. Have you found a way to buy essential oils without the plastic lid? Thanks Anne Marie for the recipe. I didn’t know essential oil was easy to make! Thanks for posting this – I looked everywhere for a DIY dish soap recipe and it was so hard to find one that was plastic-free! I’m going to make my own as soon as I run out of my current bottle. About how much of the bar is used for 3 tablespoons? Just trying to get a handle on how much dish soap you can get out of every bar. Janie, I used up about 1/10 of my 5oz Dr Bronner bar. I grated it use the ‘big’ side of my grater. Maybe it would have used up more using the ‘small’ side. Thanks for this post! I made this last weekend with my daughter, and we had lots of fun. I’m trying to cut down on plastic waste and have started eyeing all my soap products disapprovingly. This will save lots of dish soap bottles from getting thrown away! I did add a bit of glycerin to the mix, which did come in a plastic bottle, but there was enough in that to make this recipe about 40 times, so I figure it’s still a net gain for waste reduction! As for the soap itself, I did have to add quite a bit more water to keep it from getting too solid. This may be due to the glycerin altering the recipe. Possibly because of this, I have to use a lot more of this that I would of my regular dish soap. But I think it’s just less potent in general. That’s okay though. From very rough mental calculations, even factoring that in, this isn’t very expensive, and most importantly, less waste, yay! I have a question…..but first I need to thank you for all your hard work and willingness to share your findings. I did make the dish soap but it continues to harden in my container after becoming liquid again when I stirred it after letting it set. Am I missing something that I should have done to keep it liquid? Thanks so much! I made this last night but it remained rather watery, not gel-like at all. Is that normal, or do I need to add more washing soda or something? A little thrown off because of the mention that it might get too solid, but I’m having the opposite problem. I used filtered hard water if that makes a difference. Hi Alicia, did it gel up at all? Did you try it? Does it suds up at all? I’m not sure if your water affected it or not. 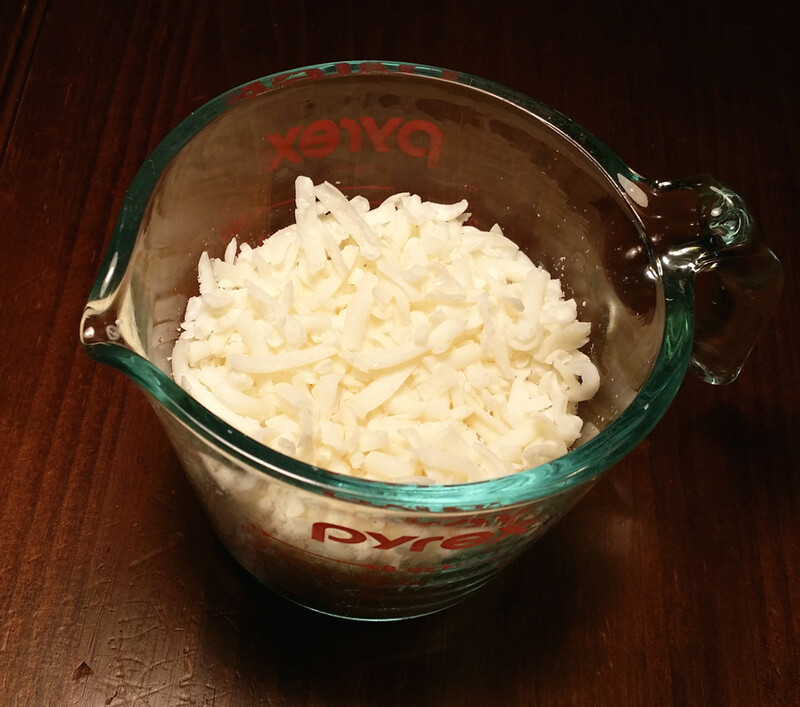 If you have bar soap and washing soda left, you might want to try adding more to what you have. I think that’s worth a try.